career, aviation is a great field. we have a training program just for you! We are seeking an enthusiastic, self-starter, individual who loves a challenge! A minimum five years experience in human resources with a PHR or SPHR. Working experience of Microsoft Office and Access as well as complete knowledge of ADA, FMLA, EEO, DOL and Affirmative Actions programs is a must! The HR Generalist reports to the Chief Financial Officer but works daily with the President and other managers. AvEx offers a competitive wage depending on experience along with a benefits package including paid employee medical, vision, life, holidays and vacation with optional dental, AFLAC and 401(k) retirement plan. Please visit our website to learn more about our company www.avexpainting.com. Qualified applicants may email resumes to denise@avexpainting.com or visit LA Works at 101 Ember Drive, New Iberia, LA 70560 to apply in person. Because of security reasons, we are unable to accept applications on site. Aviation Exteriors Louisiana, Inc. is an Equal Opportunity Employer. 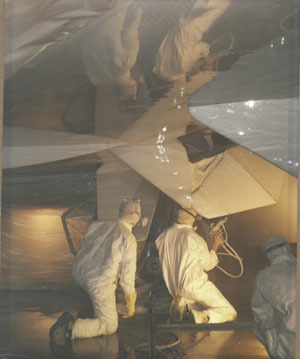 Candidates must have previous experience in auto body paint or aircraft paint with knowledge and skills of proper methods and techniques to remove, repair, and apply various exterior aircraft surface coatings - including primer, paint, epoxy, and polyurethane; must be able to operate, maintain, and clean electrostatic paint guns; must be able to read and follow blueprint directions; must pass DOT drug screen, subject to random drug screens. position should an employee want to train for a paint position or management position. This is a DOT drug screen position, subject to random drug screens. This position is very important in our company. Tasks include monitoring the movement of all lifts around aircraft and ensuring employees work safely, it also includes maintaining safety items with regard to the housekeeping, the hangar and various equipment. This is a non-DOT drug screen position, subject to random drug screens. and every employee is subject to random drug screens. AvEx pays 100% of the employee’s health, vision & life insurance, as well as paid vacation and holidays. We also offer 401k retirement plan, profit sharing and optional AFLAC, dental and family coverage. disability, or any other characteristic protected by law.